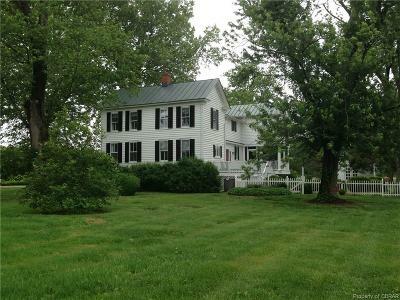 SARATOGA – A Historical Dream House, CIRCA 1790, that has seen expansions and improvements in each Century since its early beginnings. 2.6 Acre Park-like grounds surrounds this example of late Federal & Greek Revival architecture highlighted by a Cherry Tree lined drive that leads into a circular entry featuring a formal Boxwood garden setting. This 2525 sf Gem of History includes 3 working fireplaces, spacious first floor rooms and a 2nd floor that boasts 2 oversized guest bedrooms & bath and a Master Suite with fireplace & a modern all-new Master Bathroom. Add’l unique features include a large finished English Basement with fireplace & brick floor, a new screen porch, a back deck, extensive brick patio, 2-Story Amish Barn and the Crown Jewel – a totally restored SUMMER KITCHEN that now includes HVAC resulting in a Formal Dining building with its own brick lined root cellar! Landscaping offers notable attention to detail with 4 Magnolias, Plum, Pear & Fig trees, Pergola of Rose, Clematis & Honeysuckle plus 60 ft Asparagus Patch & several small gardens! Offered only in “AS IS CONDITION”, with Home Inspection for Buyer Information Purposes Only. SEE THE ATTACHED HISTORY document.